The snowdrop bloomed when I wasn't looking. If one could bring forth blooms in the garden by simply staring at the poor little plants until the flowers burst forth, I would be living in a floral paradise right now. I spent many hours today (it was probably just a few minutes) hunched over looking through the leaf litter and mulch at the tiny leaves of crocuses and irises coming up, hoping to see a bloom or two. Or hoping to see at least a hint of a purple bud. I didn't seen any blooms today, but I suspect I might see some blooms tomorrow. I just have a feeling that's how spring will go this year -- quick. At least that's what I sense is happening. Last Sunday I was clearing off the driveway, vowing to trade in my single stage snow blower for a two stage snow thrower, because the snow was just too deep and too heavy for my poor little struggling machine to blow or throw anywhere. Now this weekend, the snow is melting, and though it isn't all gone, there is plenty of bare ground and lots of little green sprouts coming up. Plus, the weatherman has promised "seasonal temperatures" this week, which means day time highs in the upper 50s. Good-bye Frosty the Snowman. Hello, Spring. You'll get no complaints from me about a quick spring. You may however, hear a few moans and groans about a little back soreness caused no doubt from being hunched over for hours (probably a few minutes) looking for spring blooms. And I might go on a bit about how this quick spring, if indeed we have a quick spring, has put me quite behind in the garden. Quite behind. Though truthfully, I set myself behind a bit last fall when I decided to do most of the garden clean up in the spring. What was I thinking? Oh, I remember now what I was thinking, or rather doing. I spent most of my gardening time last fall crawling around the back lawn planting crocus corms and glory-of-the-snow bulbs. Thousands of them, literally. We have the added bonus of daylight savings time starting this weekend, so now I'll have more light later in the day to see my garden. I think I'll spend some of that extra evening light time staring down at some plants, seeing if I can make them bloom, even if it isn't good for my posture to be all hunched over like that. No bare ground here yet. We'll see how fast spring arrives. 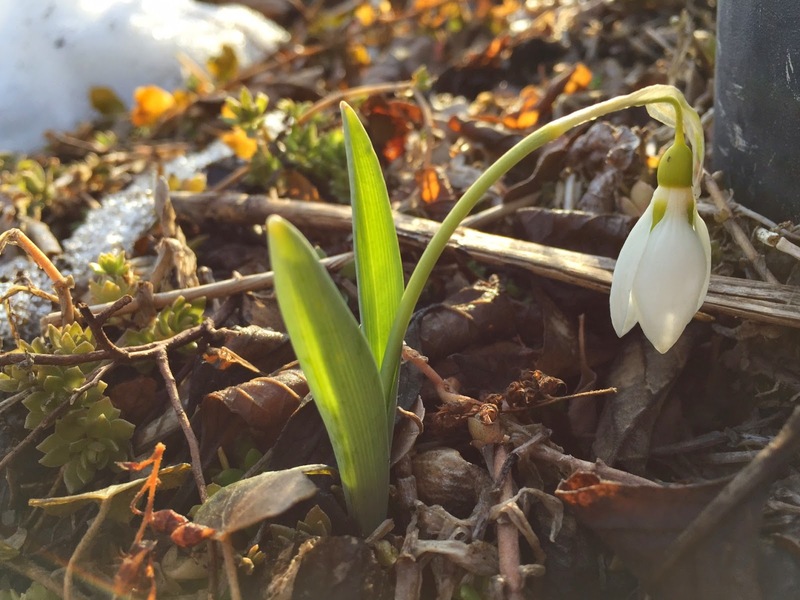 LOVE your snowdrop. So pretty. Proof I am getting older. I too have been getting down close to the ground to take pictures but oh ... these days getting back up again is getting harder to do! haha. I need more exercise.